It was another successful night across the A-10 as the league went 2-0 in a relatively quiet night of college basketball. The Dukes bounced back after a tough road loss to Penn State on Sunday; they shot 52.5% from the field and hit 13 threes in order to take down St. Francis (PA) 89-75. 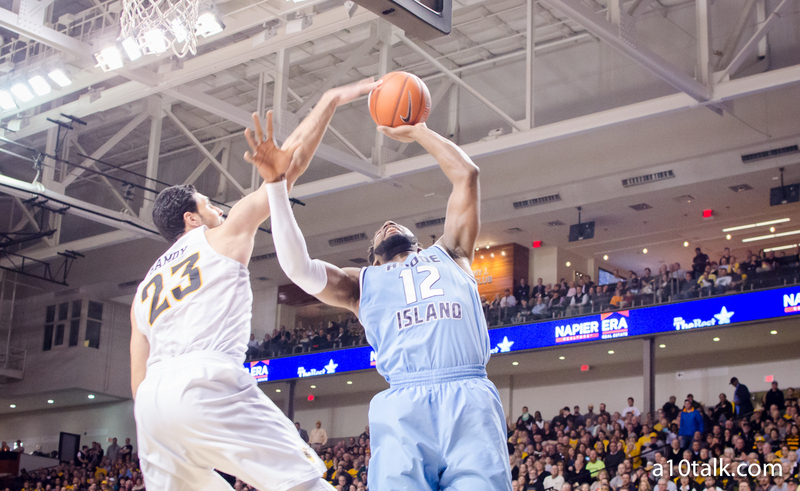 Rhode Island maintained a lead and beat inner-state rival Brown 79-72, though the Bears kept it pretty close all game, and Rhode Island had to battle in the second half in order to win this game. I encourage you to take a look at the numbers Hassan Martin has been putting up through the first three games of the season. He’s been looking great now that he’s seemingly fully healthy, and his offense and defense are both top-notch. Martin has 39 points, 28 rebounds, and 15 blocks through just 3 games. He’s been a beast on the glass and getting buckets down low, and just like we’d expect, he’s swatting opponents’ shots left and right. His 19.7% block percentage is currently 12th in the nation according to Kenpom. He finished last season 25th in that category. Hassan Martin is going to be a huge piece to this Rhode Island team this year, and the question remains whether or not he’ll be able to play this well once the Rams’ opponents get tougher. Martin serves as a huge frontcourt piece on both ends of the floor, and if the Rams can continue to get him producing at such a high level, they’re going to be a dangerous team in the league this year. Jared Terrell led the Rams in scoring against Brown with 18 points while E.C. Matthews was right behind with 17 of his own. 2. Was tonight Rene Castro’s coming-out party? Rene Castro of Duquesne came out of nowhere and performed at a very high level against St. Francis (PA) on Wednesday night. The junior guard, who transferred to Duquesne after one year at Butler, had a career-high 12 points heading into Wednesday night and had never scored in double digits with the Dukes. That changed drastically. Castro went for 26 points on 6/9 shooting from three point range and added 2 assists and 4 rebounds. No one was expecting this out of a guy who barely played in half of Duquesne’s games last season. If this was a fluke, then Castro helped the Dukes get their second win of the season. But if this guy can repeat tonight’s performance, Duquesne is going to have a weapon they didn’t even know about. Castro’s efficiency from the floor is a big sign for this Duquesne team, as it does not have a very loaded roster this year. That said, a guy like Tarin Smith who had 23 points against St. Francis (PA) could also provide some enormous upside. It’s early, and there’s a lot of basketball to be played, but this was a very pleasant surprise for Duquesne. Rhode Island had a -24.5 advantage on the betting line heading into this game, and though the Rams never really seemed in serious danger of losing this contest, Brown really hung around until the end. This Brown Bears team is not great by any means, but it was the toughest game Rhode Island has played all season. After a 107-65 pounding of Marist, a lot of us probably thought Rhode Island would take care of Brown early, and though they did get the win, it might have been a little too close for comfort. One concern for this team may be rebounding. The Bears only played one player taller than 6’6, and yet, the Rams got outrebounded 38-31 and allowed Brown to pull down 16 offensive boards. In addition, the Rams committed 25 fouls and only shot 59.1% from the line. Despite all of this, they still won by 7 points and move to 3-0 on the season. Martin and Iverson did run into some foul trouble, so I really wouldn’t be too concerned about the outcome of this game. That said, watch these trends, as the Rams have now had 2 games with at least 25 fouls this season. Follow us on Twitter, like us on Facebook, and check out our forum for more A-10 content.